I have been interested in art ever since childhood. Whenever I was bored and asked my mother "What should I do?" she always responded "Why don't you draw something?". I would happily pull out my crayons and spend hours sketching whatever was in front of me. I continued to draw and paint throughout my life, although boredom ceased to be my motivation many years ago. As an art major in college, I was introduced to pastels. They were a perfect fit, and I have never looked back. I find the unlimited variety of color and effects that can be achieved endlessly fascinating. Almost all my work is created with pastels, although I sometimes experiment with oils and other media. 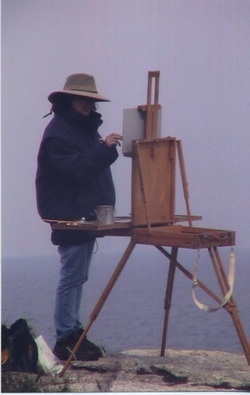 I look forward to devoting more time to plein air painting and exploring new subject matter.